It was only in 1991 that the Canadian Tiger Swallowtail was recognized as a species separate from the Eastern Tiger Swallowtail . Differences in adult size, wing coloration patterns, host plants, number of broods, and other heritable traits are the basis of differentiation (Hagen, et al. 1991; Sperling 1993; Scriber et al. 2003). In the field in Massachusetts, tiger swallowtails can be provisionally identified as one species or the other if they are seen well. Observers in our area have been reporting them separately since 1993, although many identifications are still somewhat uncertain. But the fact is that all of Massachusetts except the southeast coastal plain lies within a broad “hybrid zone” running from the Great Lakes through New England, a zone in which phenotypic and genetic traits between the two tiger swallowtail species vary clinally south to north. The differences and gradations between the two taxa in this zone are complex. Genetic differentiation and speciation are ongoing processes for these taxa in our area (Scriber et al. 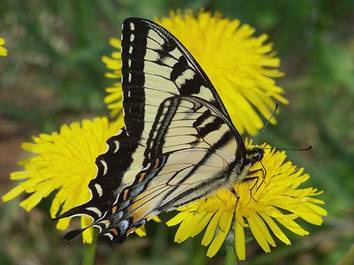 2003), and what we now call "Eastern Tiger Swallowtail" (see that species account) may in fact be a hybrid between P. glaucus and P. canadensis. Field observers have photographed individuals which appear to be intermediate between the two species (e.g. http://boghnielsen.com/2010/0703/index.html ; E. Nielsen, masslep 7/19/2010). Throughout Canada today, Canadian Tiger Swallowtail is widespread and common, whereas what appears to be Eastern Tiger is usually found only in southern Ontario (Layberry et al., 1998). Massachusetts is at the southern edge of the Canadian Tiger Swallowtail's range (Cech 2004). Little can be deduced about the early history of Canadian Tiger Swallowtail in Massachusetts, except that as a species which prefers edge and early successional habitat, it, like what we call the "Eastern Tiger Swallowtail," probably benefited from the timbering, burning, and grazing that took place between 1600 and 1850, as European settler agriculture expanded. Its numbers may have increased in those years (Table 1). The earliest museum specimens currently identified appear to be Tyngsboro 6/25/1926 (Harvard MCZ) and Concord 6/15/1937 (Yale Peabody), and an early "western Mass." specimen, 6/16, no year (MCZ). An inordinate number of tiger swallowtail specimens (about 51) were taken in various Berkshire County towns in 1966-1968 by C. G. Oliver. These are now at the Yale Peabody Museum and include both Eastern Tiger and Canadian Tiger Swallowtails. Canadian Tiger Swallowtail was thus documented from Becket, Dalton, Hinsdale, Lee (October Mountain), Otis, Sandisfield, Sheffield (1982), and Washington, but this result could have been achieved with much less loss of life. Range-wide, the preferred hosts for P. canadensis are aspen and birch; whereas for P. glaucus the preferred host is tulip tree. Larvae of each do not fare well on the other’s main host plant (Scriber et al., 2003). Black cherry is a host common to both species; the Connecticut Atlas found P. canadensis ovipositing on black cherry in the wild. Photographer Sam Jaffe found “tiger swallowtail” larvae on poplar in the Worcester area early in the season, but the exact species was not distinguished. In Canada, P. canadensis may also use willow and ash (Layberry et al, 1998). More research is needed on what hosts this butterfly is using in Massachusetts. The Canadian Tiger Swallowtails host trees, aspen, birch, and black cherry, are early successional species in Massachusetts, re-growing quickly after a site has been cleared or burned, but then giving way to other tree species of the mature forest. As noted, Canadian Tiger Swallowtail may benefit from some limited forest clearing, and it likes dirt roads. It is not a species of mature, closed-canopy forests, so as re-growing forests have matured in many areas, habitat may have been lost. The Canadian's preferred habitat is open areas, lightly used roadsides, woodland edges, and streamsides. Like the Eastern Tiger Swallowtail, the Canadian is “very fond of assembling in companies around spots of moist earth or on the edge of pools by the roadside after a rain" (Scudder 1899: 1295). According to 2000-2007 MBC sight records, swallowtails identified as Canadian rank among the Uncommon butterflies in Massachusetts (Table 5). The Canadian Tiger Swallowtail is much less frequently reported than the Eastern Tiger Swallowtail. Between 1991 and 2009 in MBC records, there were 6793 reports of Eastern Tiger Swallowtails compared to only 1263 reports of Canadians. However, there were also 6169 reports of “Tiger Swallowtail spp.”, many of which could well have been Canadians, since observers usually resorted to this category during Canadian Tiger Swallowtail flight time. The two tiger swallowtail species were not distinguished during the 1986-90 MAS Atlas, so comparisons with those years are not possible. And in MBC records, there is uncertainty about identification, so that reports of sighting frequencies or trends are not very meaningful. However, the number of Canadians reported per total trip reports increased greatly between 2000 and 2009. Between 1993 and 2013, Canadian Tiger Swallowtail was reported from 63 towns out of a total of 351 (Map 4). Virtually all reports have been from western, central and northeastern Massachusetts. There are no reports from the southeastern towns, or Cape Cod or the Islands. There are two reports from towns near Boston (Arlington, Canton), but given the difficulties of identification, these remain uncertain. From Middlesex County there is an early (1937) specimen from Concord, Massachusetts, in the Yale Peabody Museum, retroactively identified as Canadian Tiger Swallowtail, and one 2009 sight report from Acton is included on Map 4. From Essex County north of Boston there is also one historical specimen (Tyngsboro 1926, MCZ), and enough recent photographic and sight evidence to feel confident that the species has occurred there, though rather rarely. Locations which have been especially productive for this species are Mount Greylock (max 235 on 6/5/1999, T. Gagnon; also 157 on 5/29/2012, T. Gagnon); Pittsfield (max. 45 on 6/4/2009, B. Spencer); Peru (max. 38 on 6/12/2009, B. Spencer); Lee/Washington October Mountain SF (max. 5 on 7/10/1999, T. Dodd and B. Cassie); Petersham Tom Swamp (max. 45 on 5/27/2012, T. Gagnon et al. ); and Windsor Notchview (max. 5 on 6/8/2011, B. Spencer). Throughout its range, the Canadian Tiger Swallowtail has only one generation, while the Eastern Tiger Swallowtail and the various hybrids have two or more. This is one of the key traits distinguishing Canadian Tiger Swallowtail, and thus flight time may be an aid in field identification. According to MBC records 1993-2008, the flight of Canadian Tiger Swallowtails begins in early May, and lasts only until mid-July (http://www.naba.org/chapters/nabambc/flight-dates-chart.asp ) The Eastern Tiger Swallowtail flies both earlier and later than the Canadian, based on these field identifications. Earliest sightings: MBC reports of Canadian Tiger Swallowtail are most reliable from 1999 onward. In the 15 years of BOM-MBC records 1999- 2013, the six earliest "first sightings" are 4/19/2012 Whately, B. Benner; 5/1/2010 Leverett, C. Kamp; 5/4/2013 Longmeadow Fannie Stebbins WS, schmev24 (photo); 5/6/2000 Franklin Co., T. Gagnon; 5/6/2001 Worcester, B. Walker; and 5/6/2002 Northampton Florence, T. Gagnon. Thirteen of the fifteen first sightings have been May 15 or earlier. The influence of the early springs in 2012 and 2010 is apparent. The first sighting dates for Canadians average later than those for Eastern Tiger Swallowtail. Latest sightings: In the same 15 years of records, the "last sighting" dates reported for Canadian Tiger Swallowtail usually come from the Northern and Central Berkshire NABA Counts. These are held on a pre-determined day in mid-July, and so do not reflect searches through time. In addition, in the spring and through July, the Eastern Tiger Swallowtail is also flying, and sight reports from a distance cannot be considered reliable. With these caveats, the five years with latest dates reported between 1999 and 2013 are 7/26/2008 (Royalston, C. Kamp); 7/21/2012 (C. Berks NABA); 7/20/2013 (C. Berks. NABA); 7/16/2011 (C. Berks. NABA, "most worn and tattered"); and 7/15/2001 (C. Berks. NABA). In Canada, Papilio canadensis is widespread and common. Within its northern range limits, it adapts well to temperature and habitat variations. Cech (2004: 65) terms it an adaptable generalist within its range. It remains to be seen how far its southern range can stretch, and whether climate warming will lead to a range contraction northward, and thus a decline in Massachusetts. If climate change actually results in colder though shorter winters in Massachusetts, the Canadian Tiger Swallowtail could hold its own, while the classic southern Eastern Tiger Swallowtail (P. glaucus) could decline. 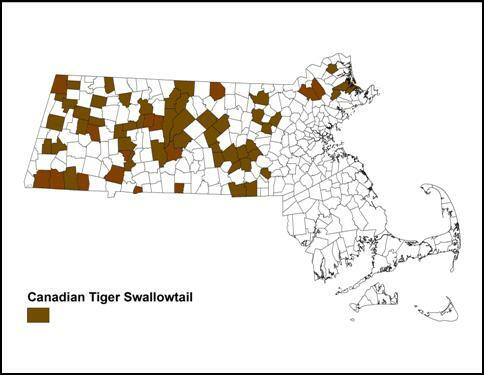 NatureServe currently (10/2013) lists the Canadian Tiger Swallowtail’s status in Massachusetts as S5 or secure.